The right-wing Alternative for Germany (AfD) parliamentarians have embarked on an extraordinary trip to assess the situation in Syria and boost the party’s hopes of sending back half a million Syrian refugees from Germany. On March 6, members of AfD took to social media to illustrate their trip to Syria, showing pictures of Damascus and posing with allies of Syrian President Bashar al-Assad. According to Deutsche Welle (DW), the group is comprised of four Bundestag MPs as well as three state parliamentarians from the western state of North Rhine-Westphalia (NRW). Helmut Seifen, the deputy leader of the AfD's parliamentary party in the NRW state parliament, told DW that during the trip to Syria the seven-man team aims to determine "whether there is war everywhere, or if there are safe areas as well," at the same time adding that MPs would likely only travel to "safe" areas. "The goal of the trip is to thoroughly inquire on-site about the humanitarian situation and reconstruction work in areas which have been liberated from terrorists," the party said in a statement cited by German news magazine Der Spiegel, adding that the trip was taken due to a lack of trust in media coverage of the conflict. On March 5, the delegation held a meeting with Syrian Grand Mufti Ahmad Hassoun, who reportedly called for Syrian refugees to return home. Christian Blex, an AfD parliamentarian from NRW, posted a picture from the meeting, having mistakenly written on Twitter that Hassoun had "emphasized how important the separation of religion and church is." According to DW, later it was clarified that the Grand Mufti had called for "the separation of religion and state." Furthermore, in his tweet Blex “asked” Chancellor Angela Merkel to invite the mufti to Germany. — Dr. Christian Blex (@ChristianBlex) 5 марта 2018 г. "We have lived through the harshness of war in Germany before and we are still aware of the suffering it brings. We were surprised when we saw people going about their normal lives in Damascus," Blex told reporters, according to the pro-Syrian government news website Tishreen. The MP was thunderstruck by the fact that some women wear jeans in the country. "Blue jeans instead of a black veil! Women sit in bars. Barely imaginable in Mecca — also sadly not in Berlin-Neukölln […]"
— Dr. Christian Blex (@ChristianBlex) 6 марта 2018 г. "That's it guys, our demand to wear tight jeans has been granted and that means all our problems have been solved… let's return home! Let the chips fall as they may." The parliamentarians’ trip to Syria has raised concerns among German Green party MPs, with lawmaker Konstantin von Notz tweeting that the AfD politicians were acting like "Assad fan boys." Last year AfD proposed to designate Syria as a safe country of origin, insisting that the war in the country was coming to an end and that Germany should start talks with President Assad to repatriate Syrian refugees. 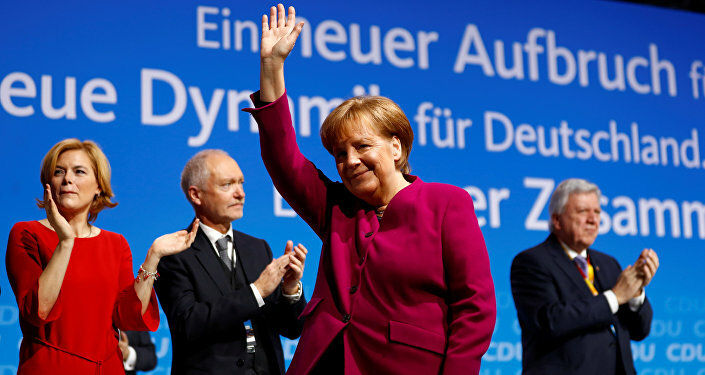 Founded in February 2013, the AfD’s primary focus was on the opposition to bailouts of European Union member states like Greece, mired in economic crisis and debts. Over time, the right-wing party has evolved into an anti-immigration party. The AfD strongly condemns Chancellor Merkel’s “open-door” policy towards refugees from Africa and the Middle East, which has welcomed more than 1.5 million migrants since 2015.